Our working board is composed of four adults who believe children’s books are a powerful way to convey meaningful ideas. We believe they can touch the hearts and minds of children and families and inspire important conversations about things that matter. Working in collaboration with children and families of diverse populations, we create picture books that reflect, support and voice the ideals of our non-profit partnering organizations. We make a place for their voices to be expressed through high-quality educational programming. Tell Me a Patch, a book revealing the raucous nature of a library and a timid little pillow who is comforted by a storytelling chair. The writers and illustrators were patrons of all ages of the Hemphill Library in Greensboro, NC. Project supported by the Greensboro Public Library in 2006. What Can A Small Bird Be?, a story involving a small bird and his discovery of eight character traits. This book was the result of a partnership between the North Carolina Department of Instruction and North Carolina Museum of Art. It was written by eight teams of teenagers across the state in 2011. 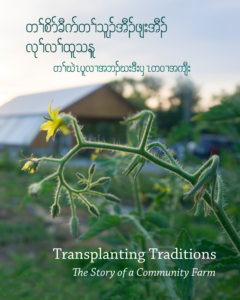 Transplanting Traditions,the story of a garden and the traditions it embraces was created from the photographs and illustrations produced by the Karen Youth Art Group in Chapel Hill in 2015 with the support of FRANK gallery. Planting Hope, the story of a hard-working girl and golden seed who unite a contentious garden. This book was comissioned by PORCH in Chapel Hill and produced in collaboration an ELS class at Smith Middle School in Chapel Hill and after school students at Rogers Road Community Center in Chapel Hill in 2016. Susie Wilde is a writer and teaching artist who has worked in North Carolina classrooms, libraries, after schools and museums for over 20 years. She has composed hundreds of stories with children and families and shared thousands of books. Wilde is the children’s book columnist for the Raleigh News and Observerandinterviews and writes reviews for Audiofile Magazine. Along with thousands of columns, her published works also include a picture book, Extraordinary Chester, and a book for teachers, Write-A-Thon! How to Conduct a Writing Marathon in Your 3-5th Class. Peg Gignoux has facilitated over 60 successful community based textile art residencies in NC over the past twenty years. Her work as a teaching artist has allowed her to work with diverse communities of all ages and abilities in a variety of settings: hospitals, K-12 schools, museums, colleges, libraries and shelters throughout North Carolina. Projects have included pop-up books, story quilts, and mixed media works for public spaces. Steve Godwin is a book designer with 25 years of experience. During the last 10 years he has designed a number of books for private publishers, including full collaboration on several children’s books. Since 2012 he has worked as a designer for Algonquin Books of Chapel Hill. Before that, he directed the design and printing of curricular materials for K12, Inc., an education services company. His freelance clients have included Georgetown University Press and Smith Center for Healing and the Arts. Additionally, Steve is a visual artist and writer, and has been awarded residencies at The Vermont Studio Center in 2005 and 2008. Andrea Tanner is a grant writer with For Kids By Kids, whose mission is to work in collaboration with children and families of diverse populations to create picture books that reflect, support and voice the ideals of non-profit partnering organizations while providing positive quality art programming. She served on the Board of Directors for a local public library in suburban Philadelphia, for which she wrote grant applications and explored other funding opportunities in the community. For the last six years, she has been a member of the Town of Carrboro Human Services Advisory Board, which is responsible for reviewing outside agency funding requests from nonprofits who serve its residents.